Mostly because I’m a spastic cook. 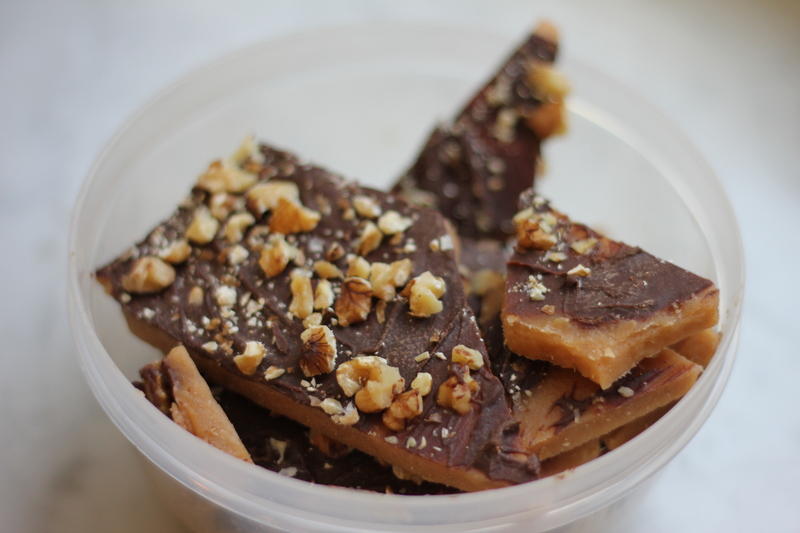 But today I cannot resist sharing a link to an insanely simple toffee recipe that produces wonderful results. Ingredients? Butter, sugar, a bit of salt. (Stop cringing, I never claimed it was good for you. It’s toffee.) I seriously recommend this recipe if a) you aren’t much of a cook, b) you need something for a Christmas potluck, etc., c) you have a sweet tooth. I have recently come across a few articles to share. The first is titled Woman ‘injected client’s buttocks with cement.’ Think of my posting this as a confession that I don’t solely read The Economist and the NYT. (Hard to believe, eh?) Basically this article is about the dark side of unlicensed body enhancements. Also, CBS has created a list of 25 college majors with the highest unemployment levels. I don’t know how they gathered this info, but I was excited to see that journalism was at the bottom of the list. I particularly enjoyed that number ten on the list was a tie between performing arts and engineering. Those majors should get together and make offspring. Really. My third link is to a NYT feature about a chocolate factory in Bali. Everything about it is marvelous, particularly the planned fireman pole for the owners to use to get from their office to the kitchen. I have made the bizarre discovery that, though children avoid bedtime like Sarkozy is avoiding Sweden, they love playing “pretend bedtime” in the middle of the day. Pretend bedtime goes something like this: “Shebooooon, close your eyes, you sleep here,” 3-year-old Teddy points at a couch. I comply. He runs to the other couch with his brother, Tim, and they lie down and close their eyes. Five seconds pass…and: “MORNING!” Teddy yells, shrieks with laughter and jumps off the couch, while Tim pretends to wake up. I also open my eyes. “It’s morning!” Teddy shouts a few times. And then…”Bed time!” The cycle repeats. Things my boyfriend and I have argued about. Part 2. 2) What constitutes an awkward moment. Our awkward meters are completely different: if I worked out at the gym every time we disagreed on the validity of each other’s awkward stories, I would have David Beckham’s body. Or abs anyhow. 3) Our relationship status. Specifically, when we began dating. In his head, we began dating when we began hanging out one-on-one. In my head, we were just friends. He finally decided to “let me know we were already dating” (his words), and asked me out on an official date. This is when I was clued in. It gets better. To me, (and, I’d wager, most of the rational world), the step from dating to boyfriend/girlfriend is a big deal. It’s an important transition from the ambiguous, expensive, gettingtoknowyouwhileplayingitcooljustincase pool of confusion that is dating, to the titled, cheaper, officiallystuckwithyouforthemoment state of girlfriend/boyfriendhood. One of the main differences is the breakup: breaking up with a gf/bf requires a face-to-face conversation (yes. really it does. ), some level of guilt, and a significant catalyst (it’s physics: couples in motion tend to stay in motion unless acted upon by an outside force). Me: So, should we talk about whether or not we want to title our relationship? Or when we should? Him: (flipping through Calvin and Hobbes) Oh, whatever you want. I’ve already been referring to you as my girlfriend. Alright, so I made the Calvin and Hobbes part up. The rest is spot on. 4) Our placement during Skype calls. How close or far we are supposed to be to the camera, and how big we expect the other to have our image. I make those toffees every year. YUMMMMMM. Is anybody else confused about which blog you are using? Omg Psychology. Fail, fail fail. So sad that such a beautiful field is dying. I like that most of the things you mentioned I heard about from you in person. Okay, well actually less than half. 2/5. Still, that’s not bad. Clearly I’m finding small, irrelevant ways to make myself feel superior. @christine: I’ve been using this one since Feb. I’m just terrible at updating. I’ve actually taken the last one down temporarily, if that helps.